The ad-hoc Committee on Electronic Protectors of the World Taekwondo Federation announced its evaluation results of an electronic protector demonstration on March 28, 2006. The demonstration, the second of its kind by WTF after the demonstration on July 20, 2005, took place at Kyung Hee University on March 25, 2006. The demonstration attracted four companies: LaJUST of Korea, ATM of Austria, True Score (Impact Measurement), a U.S.-Korea joint venture, and Daedo of Spain. With regard to the electronic protector system comprising of just the body protectors, LaJUST was the only participant that passed the "acceptable" level of the basic technical requirements to be applied to taekwondo competition. The systems of two other companies, ATM and Daedo, failed to meet the requirements in the category of "differentiation of valid impact and invalid impact." The system of True Score failed to meet the acceptable level in two categories: "accuracy of the sense-impact level" and "differentiation of valid impact and invalid impact." The other two basic technical requirements are "consecutive impacts" and "calibration." In demonstrations of electronic protector systems comprising of both the head and body protectors, however, the two demonstrators - LaJUST and Daedo – failed to meet the acceptable level of the basic technical requirements. The company that passed the evaluation is required to undergo both laboratory and field tests. Laboratory tests, which will be conducted by the Korea Institute of Sports Science (KISS), will involve sense-impact level tests, transmission systems, safety on electricity and electronics, and endurance of materials. Fields tests, whose contents and criteria will be made by the ad-hoc committee, aim to determine the conformity of the system to real-life competition, testing the system in a "live" competition setting. After evaluating the overall tests, the ad-hoc committee is scheduled to present its final evaluation report to WTF, which will be used for WTF's selection of official electronic protector companies. WTF is to make a progress report on the electronic protectors before the WTF Executive Council meeting and the General Assembly during the 6th WTF World Junior Taekwondo Championships scheduled for July 26-30, 2006 in Ho Chi Minh City, Vietnam. The ad-hoc committee recommended WTF to allow the companies that failed this time to apply for additional evaluations. But the committee made it clear that the companies that want to be re-evaluated should undergo all the evaluations in the four basic technical categories and laboratory and field tests. As part of WTF's reform program, the ad-hoc committee on electronic protectors was set up in July 2005 and held its first meeting together with a demonstration of electronic protectors on July 20, 2005 in Seoul. The committee is composed of nine members, including Mr. Soo-nam Park, vice president of WTF, who serves as chairman of the committee; and Mr. Eui-min Ko, chairman of the WTF Technical Committee. In accordance with the recommendations of the ad-hoc committee after the first demonstration on July 20, 2005, WTF commissioned the KISS to produce a report on basic specifications of electronic protectors. On Dec. 30, 2005, WTF announced the specifications. 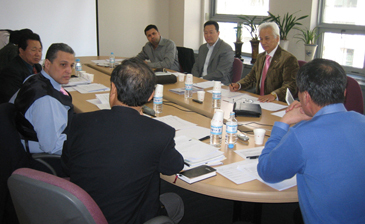 WTF aims to introduce the new electronic protector system at the 2007 World Taekwondo Championships to be held in Beijing, China, in 2007 and plans to introduce the new system at the Beijing Olympic Games in 2008 to ensure fairness in refereeing and judgment at taekwondo competition. "We are doing our utmost to introduce the new electronic protector system without fail, which will make a milestone in the history of taekwondo," said Chungwon Choue, president of WTF.